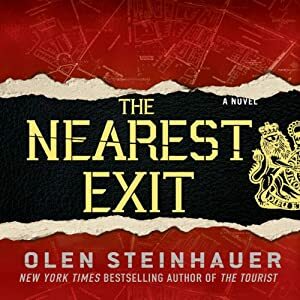 The Nearest Exit by Olen Steinhauer is the sequel to his first book in the series, The Tourist. Milo is an everyday working shlub trying to keep his marriage from falling apart. The only difference is that he works for the Department of Tourism, a secret CIA organization dedicated to doing the work that’s so dirty even the regular CIA won’t do it. Oh, and his Dad is a former Russian spy. Reading the summary, it sounds pretty over the top, but it’s to Steinhauer’s credit that he can make the mounting absurdities hang together. Milo and other characters we meet along the way are more than the typical two-dimensional James Bondian types and they have personalities that take them beyond the plot mechanics they take part in. For all the discussion critics have made of these books being post 9/11 spy stories they are still very rooted in the cold war. In fact in The Nearest Exit the author seems to be breaking down the cold war organization he has created. Certain hints left in the book indicate that Steinhauer is looking to have Milo shake off those cold warrior shackles and move on towards the new world order in intelligence following September 2001. Whatever happens, his latest book has left me eager to see where Milo heads next. Last Words: The beginning gets off to a slow start and leaves you wondering where things are going, but the story picks up for a strong finish. A great entry in the promising Tourism series.